The Great Western Air Ambulance Charity, known as GWAAC, has received a large donation of £250,000 from the John James Bristol Foundation, to go towards the purchase of their new air base. The John James Bristol Foundation is a grant making trust which gives donations to charities which are making a difference to residents in Bristol, and this year they have chosen to donate a large sum to the air ambulance, which provides services across Bath & North East Somerset, and surrounding areas. GWAAC launched an appeal in July to raise funds to buy a new purpose-built air base, which has just been constructed in Almondsbury. GWAAC’s landlords, who built the new Almondsbury air base, have offered the charity the opportunity to buy the new base, which will secure their future as a charity and the service to local residents. Kate Baldwin, Trusts and Grants Fundraising Coordinator for GWAAC, said: “At the charity we are delighted to receive this incredibly generous donation from the John James Bristol Foundation. Anna Perry, Chief Executive, said “The GWAAC medical team are so excited to be moving into the new base. It is going to make such a difference to the service we can provide, as the building will allow us to improve our training, as well as increase the welfare facilities available to our hard working crew. Thanks to donations such as that from John James, GWAAC are closer to reaching their target of £1.25 million to be able to buy the base. The charity is funded entirely by donations from the public and trusts such as John James. They receive no day to day funding from the Government or National Lottery, so this donation really is vital. 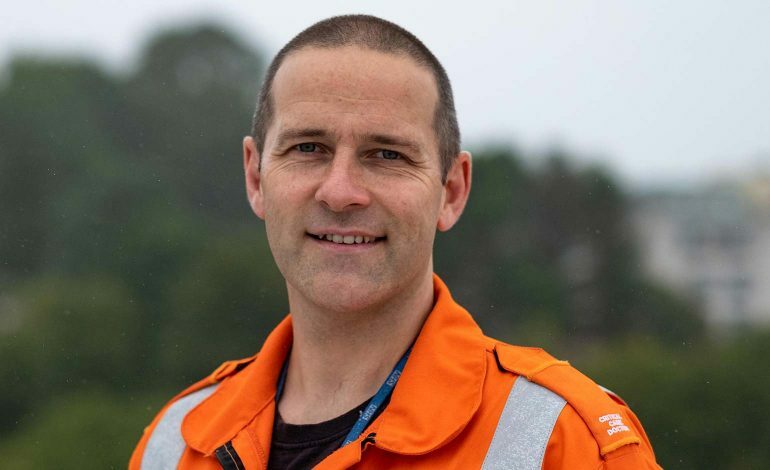 The Great Western Air Ambulance Charity’s Critical Care Doctor, Patrick Morgan, has been shortlisted for this year’s Air Ambulance Awards as Doctor of the Year. GWAAC provides the Critical Care and air ambulance service for 2.1 million people across the counties of Bristol, Bath and North East Somerset, South Gloucestershire, Gloucestershire, North Somerset and surrounding areas. Dr Morgan has been nominated for taking control of the scene at a recent incident involving a near drowning. Specialist Paramedic in Critical Care, Charli Watkins, who was on scene with him that day said: “Paddy managed to successfully turn around the mind-set of the pre-hospital team, whilst simultaneously juggling contact with multiple people and agencies on and off scene. “His exceptional leadership style meant appropriate clinical interventions were quickly implemented, and the pace kept up, but he remained professional, calm and friendly throughout. GWAAC CEO, Anna Perry, said: “We are so excited that Paddy has been shortlisted for this award, and it is a well-deserved nomination indeed. The charity’s crew attend the most critical incidents across the region by helicopter or by one of their two Critical Care cars. When someone is seriously ill or injured time is of the essence, and they need expert help fast. 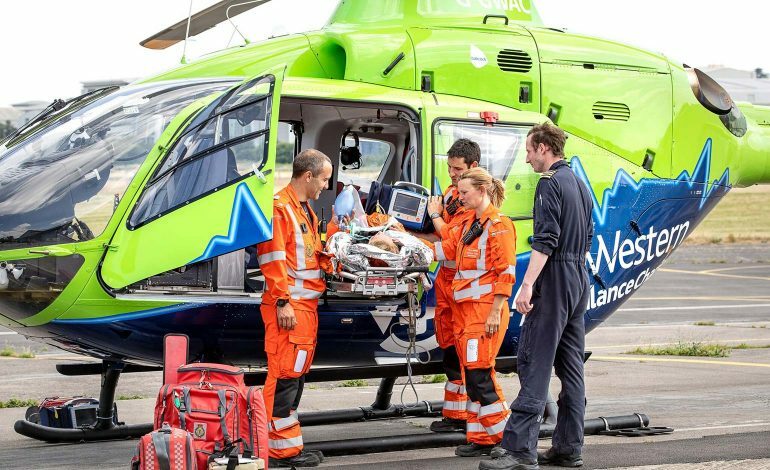 The GWAAC Critical Care team consists of a highly trained and experienced Pilot, a Specialist Paramedic in Critical Care and a Critical Care Doctor. From emergency blood transfusions to roadside amputations or treating cardiac arrests, their crew specialise in Pre-Hospital Emergency Medicine and Trauma Medicine, bringing the skills and expertise of an Accident and Emergency Department to the patient. As a charity they need to raise over £3 million each year to stay operational, but receive no day to day funding from the Government or National Lottery. This means they rely on the generosity of their donors and supporters to stay operational. The awards will take place Wednesday 24th October. The Great Western Air Ambulance Charity (GWAAC) recently revealed that they have attended a record number of incidents in Bath and North East Somerset since January this year. The service, which is entirely charity funded, attended to patients in Bath and North East Somerset 85 times, via helicopter or Critical Care car, this year so far. This is 26 more than the first half of the year in 2017. This figure, if replicated during the following few months of 2018, will prove to be the charity’s busiest year to date. The charity provides the Critical Care and Air Ambulance service to 2.1 million people across the counties of Bath and North East Somerset, Bristol, South Gloucestershire, Gloucestershire, North Somerset and surrounding areas. They receive no day-to-day funding from the Government or National Lottery. The team consists of highly skilled Critical Care Doctors and Specialist Paramedics in Critical Care, who are able to carry out life-saving interventions such as blood transfusions, and administer anaesthetics, at the scene of an incident – in effect bringing the skills you would usually find in an Accident & Emergency department to your garden, the roadside, a park or your home. The GWAAC crew attend on average 5 incidents every single day, providing cutting edge Critical Care at the scene of an accident or medical emergency. GWAAC recently launched an urgent campaign, ‘Buy our Base’. They are appealing for public support in buying a new air base, as their current one is no longer fit for purpose. Their base in Filton is one of the oldest in the country, and unfortunately is no longer meeting the needs of the increasingly busy service. Added to this, the entire site is set to be re-developed, and will no longer be able to host the service. Luckily their current landlords, BAE Systems, is building a new air base in Almondsbury for the charity, which will provide a modern home for the life-saving service and which GWAAC will move into before the end of 2018. BAE have now offered GWAAC the opportunity to buy this new air base, thus providing the charity with stability for the foreseeable future. GWAAC’s Lead Doctor, Ed Valentine, explained: “It has been interesting to see the stats come through about the jobs we have been on since January, 85 of those being in B&NES. “It is important for our charity that we are able to continue to offer this service as B&NES local air ambulance, and so we are calling on the help of the public to buy our new air base and keep us flying way in to the future. The new air base will cost GWAAC £2 million to buy, and they are asking you to help them raise £1 million towards this, plus £250,000 to fully kit it out. That is in addition to the £3 million needed by GWAAC each year to stay operational. Great Western Air Ambulance Charity is in need of funds to continue operating. THE GREAT WESTERN AIR AMBULANCE CHARITY is currently seeking funds to support the 'Buy Our Base' campaign. The charity is currently functioning out of their site on Filton Airfield, however the base is now not meeting the needs of the increasingly busy service. A new base, just the other side of the M5 in Almondsbury, is currently being constructed and the charity want to raise funds to buy it. The new site will allow the organisation to continue their good work, whilst also dealing with the increase in demand of the service they provide. On average, the service is called on five times a day. However this summer that has increased to over 12 calls on average. The current air base is the oldest functioning hangar in the country, having been in use since before WW1, so obviously the charity is looking to move on to a more suitable home. Filton Airfield is also due to be redeveloped, so the site would no longer be able to host the charity and their operations. Watch: Footage showing the hangar in which the charity currently operates out of. Footage showing the current GWAAC base in Filton. The current landlord of the airfield, BAE systems, has decided to build the new air base in Almondsbury. However they have now offered the charity the chance to buy the site for a much lower price than the development has cost. This will help to sustain the future of the GWAAC. There have been large numbers of people supporting the move of air base with Lady Bathurst, owner of Cirencester Park Estate, joining the 'Buy Our Base' appeal as a patron. She is calling for everyone in the area to 'show their support' for a vital organisation. "This is a unique opportunity, and a vital one, to ensure the longevity of our wonderful Great Western Air Ambulance Charity." She said. "To provide a permanent home will give us all the security of knowing this amazing service will be there for decades to come, not just the last ten years. This move will literally save lives, hundreds, even thousands and I hope the community which the GWAAC serves will support the appeal wholeheartedly. "None of us know whether we will one day need the Great Western Air Ambulance Charity’s help, and I hope none of us ever do – but there are many who would have been lost if GWAAC had not been there in their hour of need; let us all get behind them in theirs." The charity provides the Critical Care and Air Ambulance service to 2.1 million people across the counties of Gloucestershire, South Gloucestershire, Bath and North East Somerset, Bristol, North Somerset and surrounding areas. They receive no day-to-day funding from the Government or National Lottery. Alongside a highly trained and experienced critical care team at the Great Western Air Ambulance Charity (GWAAC), who bring hospital-level treatment outside to a patient in need, many more lives have been saved with the help of the Freewheelers, also known as ‘Blood Bikers’. The Freewheelers are a team of 120 fundraisers and bikers who volunteer to deliver life-saving blood products to the GWAAC every single day of the year, to ensure that people in emergencies outside hospital receive the best possible care. The year 2018 marks a decade since the GWAAC took to the skies for the first time. It’s no secret that they have saved countless lives across Bristol and the South West, and the work of the Freewheelers only helps to increase the numbers. 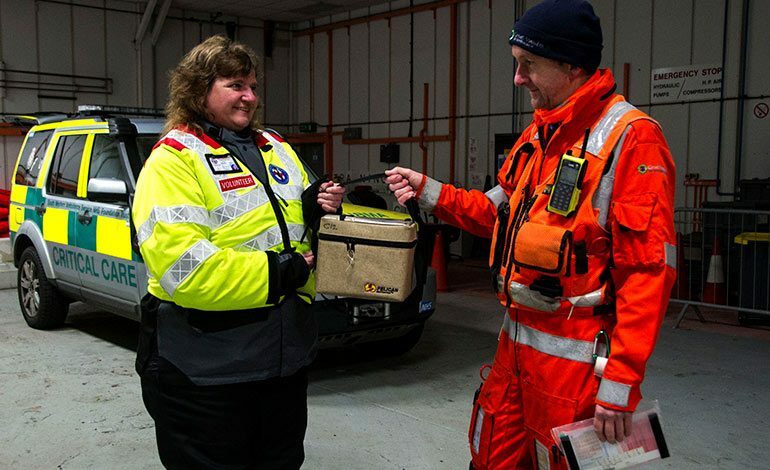 As treasurer of the Freewheelers and the first female blood biker, Mel Rowbottom collects boxes of blood products from Southmead Hospital every evening and delivers them to the GWAAC, and she constantly sees the benefits of the Freewheelers. Mel assures that there’s no wasted blood, and any unused products get taken back to the blood bank at Southmead Hospital and put (literally) back into circulation, which doesn’t cost the NHS a penny. “During the day, Southmead Hospital will take quantities out that we need to deliver that’s kept at very low temperatures, and we collect them around 6:30pm, bring them to the GWAAC and they stay in the box untouched unless the team need to use them later on,” says Mel. Blood products have been consistently delivered to the GWAAC for the last year and a half, and the air ambulance charity put these blood products to use over 80 times in 2017 alone. James Yates, a specialist paramedic in critical care, and Dr Richard Jeavons, a critical care doctor, both see first-hand the impact that the Freewheelers have on the standard of care that the GWAAC provides. “To contextualise it, trauma is the leading cause of death around the world within certain age groups, and within trauma the major cause of death is bleeding, so for us to be able to give blood to those patients who have lost a lot of blood is essential.” he says. “The benefits of the Freewheelers are that the blood is arriving at virtually the same time every evening – it’s picked up, it’s collected, and it’s taken away,” adds Richard. “There’s a very clear, easy structure for us to follow and the consistency means that we can train knowing that it’s here, and the blood is changed every day so we don’t have to worry about things going out of date. However, both James and Richard remember a time when the GWAAC didn’t have blood products to give patients, proving how much the care given by the air ambulance charity has improved with the help of the Freewheelers. “We have one shift from 7am to 7pm, and one from 1am to 1pm, and over that period we see on average four patients a day,” explains James. “That might not seem that much, but 99 per cent of the jobs we go to support the ambulance service. Mel, who is an accountant for BT by day as well as a Freewheeler by night, knows the risks and dangers of a motorbike accident. To be a Freewheeler involves being an advanced rider, and due to wanting to better her riding skills after having an accident herself, Mel completed her advanced rider training in 2003 and became a Freewheeler in 2008. “Ultimately, everybody does it because they love motorcycles, they love riding them and it’s also about putting a good image back into the public,” she says. “Everybody talks about motorcyclists, but everybody who is a motorcyclist will also either drive a car, ride a pushbike, have a family, or have a nice job somewhere. “There’s a whole multitude of people out there who are doing something good and putting a positive image back into the biker community. The other incentive at the time was that it was all male riders in the charity, so I thought ‘there’s a target there’, and I muscled my way in to be the first female blood biker in the area. “We also promote the air ambulance, which is why we do what we do – to help save lives,” Mel continues. 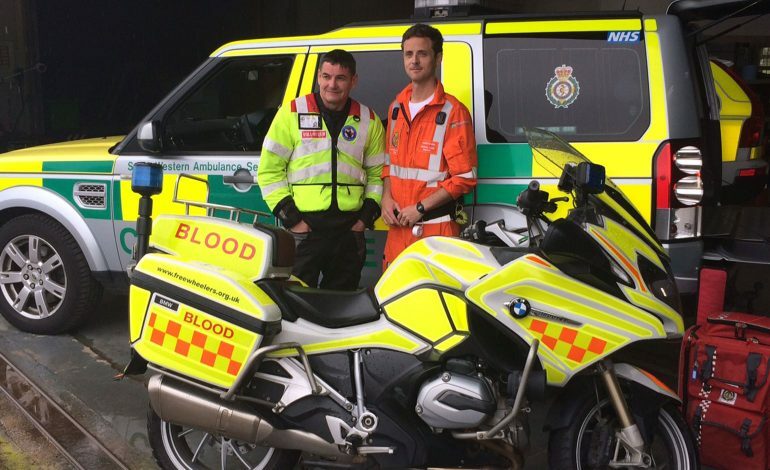 “Although we have a Bristol base we also have one in Bath and Taunton, so we’re always encouraging motorcyclists to come on board and help cover all those hospitals, and hospices too. “We have four operational bikes that work during the week, 7pm to 7am, and then on weekends from 7pm on the Friday night through to 7am on the Monday morning, on a 24/7 basis. We have a free phone number for all the hospitals and hospices to dial into, and a coordinator and telephone operator, who decide which rider is the best fit to do the job. Everyone in the Freewheelers is a fundraiser, therefore every member contributes back into the charity allowing it to run like clockwork, and out of the charity’s 120 members, around 70 of them are bike riders. As well as the four bikes in operation, the charity also have a spare set of bikes due to the vast mileage that the riders do. Every year across the fleet of operational bikes is equivalent to seven times around the world, which just shows the vast amount of routine trips that the Freewheelers take delivering delicate, live-saving products to the air ambulance. As if Mel doesn’t volunteer enough of her time to the Blood Bikers, she is also one of the organisers of the GWAAC’s third annual ride out, taking place on Sunday July 15. The event gives the public a chance to see who the Freewheelers are, as they are generally unseen due to making their rounds at night. As a result of the number of road traffic collisions that are attended by the GWAAC, the ride outs unite riders and highlight safety issues as a biker, and some riders taking part may have been patients that the air ambulance charity have saved. Mel is leading the ride out this year, controlling the 300+ bikers who turn up on the day. She also chooses and tests the route that they take, gathers marshalls to signpost every turn so all the riders get round safely, and make sure that people have fun. “It’s really fun because people stop and wave as you’re going along,” says Mel. “And because you’re promoting the air ambulance they can see why you’re doing it and hopefully encourage more people to get involved. It costs around £120,000 per year to run the Freewheelers, with £15,000 of it going towards running the GWAAC. All contributions made to the Freewheelers go into running the bikes, and next weekend’s ride out is free entry and open to all. Meet the team of bikers who voluntarily give up their free time to deliver lifesaving blood products to the Great Western Air Ambulance Charity (GWAAC), every day of the week, every day of the year. Freewheelers are a team of volunteers who deliver lifesaving blood and plasma to GWAAC every day of the year. Known as the Blood Bikes, they are all bikers who work tirelessly to carry this and other medical items across the South West. This is why Freewheelers are of utmost importance to GWAAC and indeed the public. GWAAC’s Critical Care Doctors and Paramedics have been able to save more lives since they started to carry blood and plasma as part of their kit. The Critical Care team attend emergencies where patients often need immediate treatment which cannot wait for the hospital, and the blood and plasma is vital, for example where the patient is losing blood at a very rapid rate, the use of plasma, with its vital clotting factors, can stabilise a patient. The crew are Doctors and Paramedics with specialist training and carry out many of the same surgical interventions that you would expect to take place in hospital; however, the GWAAC crew carry those out at the side of the road, in parks or in someone’s house or back garden. Therefore, the delivery of blood and plasma made by Freewheelers to the GWAAC crew is vital for saving those lives in those very critical times of emergency. 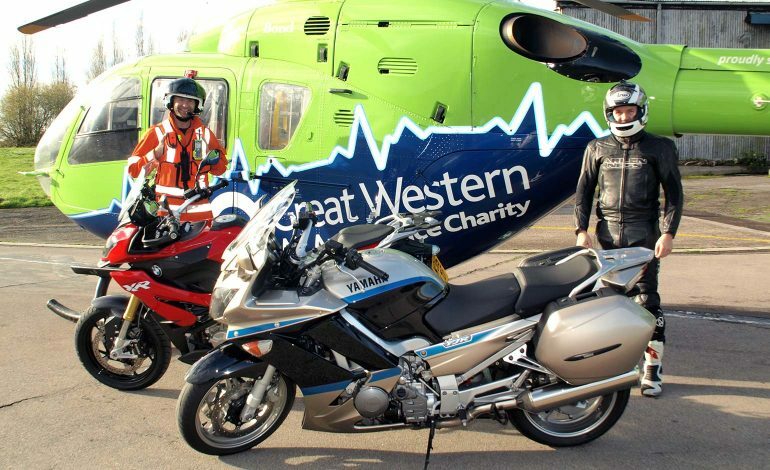 GWAAC will be hosting its third ride out event this summer, Sunday 15th July. The event is run in close conjunction with Freewheelers and in particular Mel Rowbottom, who plays a vital role in organising the event alongside GWAAC colleagues. Road safety is an integral part of GWAAC’s work. Last year, the Great Western Air Ambulance Charity attended 329 road traffic collisions, many of which involved motorcyclists. This is why they will be hosting a ride out which unites riders and highlights safety issues as a biker. Some riders taking part may have been patients that GWAAC have saved. Mel has been a biker for 16 years, an advanced rider since 2003 and a Freewheeler since 2008 (you must be an advanced rider in order to be a Freewheeler). For Mel, a full time Accountant for BT, her hobby became something of significant importance, driving a motorbike to deliver these lifesaving products. 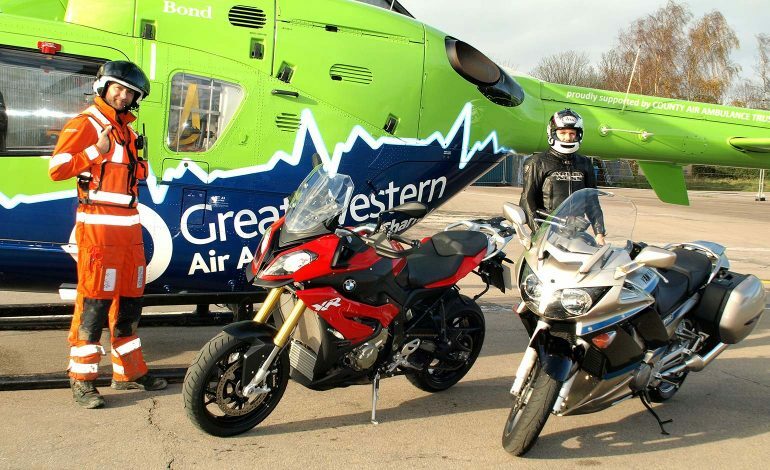 Speaking about working with GWAAC, Mel said: “Being a member of the Bristol Advanced Motorcyclists group, I often lead ride outs for them, although on a much smaller scale! “After the first GWAAC ride out in which I helped to marshall and act as the last rider sweeping up the group, I was asked to help with the organising of future ride outs and volunteered to lead. Freewheelers carry out 50 jobs a week Monday to Thursday, and up to 90 jobs over the weekend. They need to raise £120,000 per year to fund themselves and £15,000 funds their service to us at the air ambulance. In total, there are 120 Freewheelers that carry out this vital service to us all in the South West – Bath, Bristo and Taunton being the main delivery locations. The GWAAC crew unfortunately attend to a great number of motorbike accidents, so hosting this ride out as a way of fundraising to keep them flying is very meaningful to the GWAAC team and its Blood Biker colleagues. To find out more about Ride4GWAAC and support their life-saving work, click here. If you are a motorcyclist and would like to take part, you can buy your ticket here.